Customer Timeline is available both in CRM Sales Prospects and Field Service Management modules. 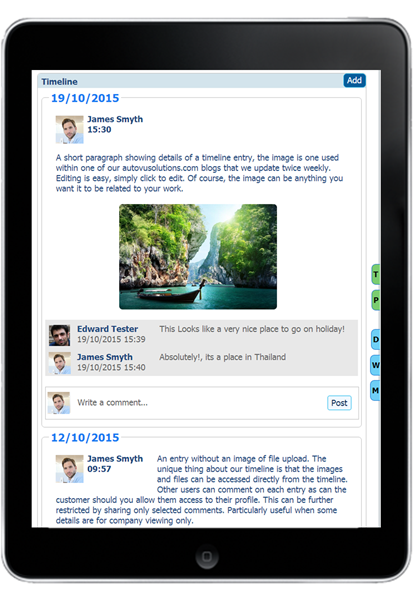 Every detail of every conversation can be recorded within the timeline, from typed information, to embedded images and uploaded documentation. 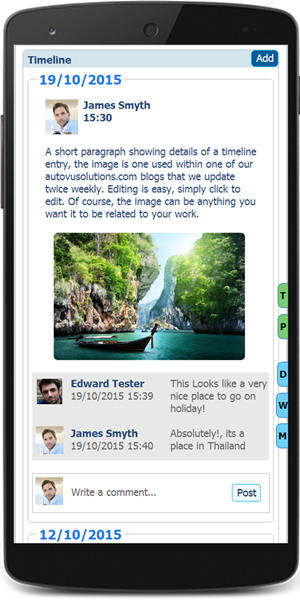 Similar to your favourite Social Media channels, AutoVu Solutions Media Timeline allows you to embed images and conversations in a timeline style layout. 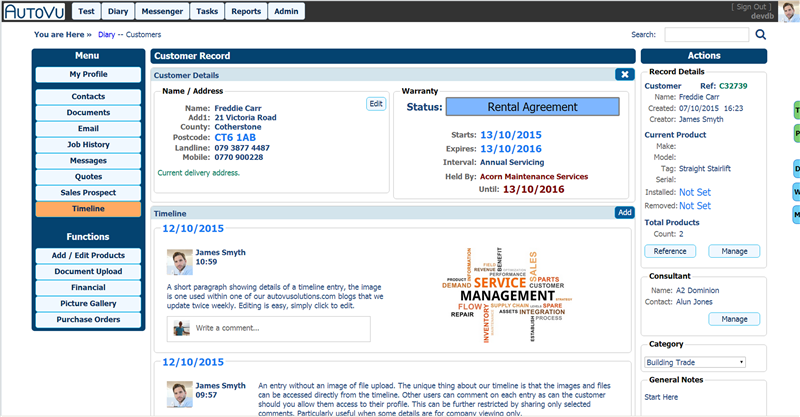 Add to this the ability to include documents within the same timeline, then you have the perfect one stop shop for all your customer document and image handling requirements. Like all things AutoVu, you have a choice. there are a number of places you may wish to store your documents and media, the Timeline is just one such place. With options to show 'Classic' view instead of Timeline, you can still see your comment and update history in a familiar list style as with many CRM systems. Social Sharing is part of our lifestyle, and AutoVu Solutions is no different should you wish to use the option. You can turn this on or off at the flick of a switch. Instantly share content with colleagues, they will receive a notification telling them you would like them to view something entered on the Customer Timeline. With a handy 'Got It' button, a reply notification will alert you that your colleague has read the information. Alternatively, they may decide to write a reply, either way you will be informed. We included this too, but with a twist. Customer information can be confidential, and may be for company viewing only. Social Sharing can be switched on or off globally to either allow or prevent the action. If you do decide to share, only the individual timeline entry and its subsequent updates will be visible to the public. Isolated in a separate location, maintaining your security and the customers privacy.